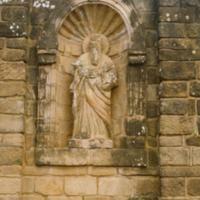 This sculpture of a saint is one of several images carved for, and installed in the church of La Santísima Trinidad, Paraguay. Carved of soft sandstone, it is missing an arm and slightly eroded. 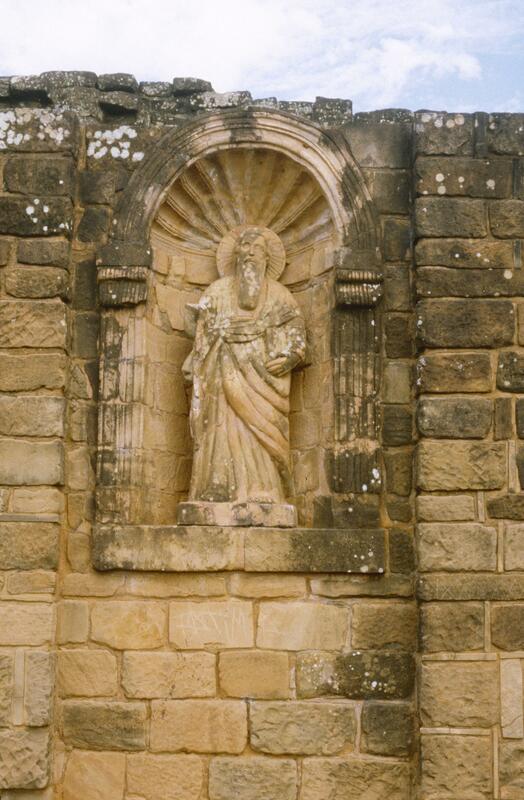 The style of carving—which emphasizes the block of the stone, with linear surface decorations—is typical of Jesuit missions in the 18th century. The figure may represent Saint Paul, one of the founders of the Catholic Church, who typically carries a book. The geometric patterning of the drapery is one characteristic feature of much Guaraní sculptural work—in both wood and, as seen here, in stone. The niche and sculptural figure would have been carved separately, although perhaps by artisans from workshops that worked closely together. In the Jesuit missions, Guaraní carvers worked in workshops, not as individual master craftsmen or guilds, as would have been the case in Spanish American cosmopolitan centers. Carvings of images to decorate churches, such as this one, might be made of wood or sandstone.